The New York Toy Fair 2013 Star Wars Giveaway is a limited-edition set given at the Toy Fair in February 2013. 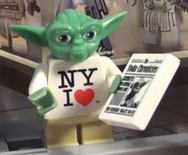 The set features a Yoda Minifigure wearing a NY I ♥ T-shirt, and holding a "The Yoda Chronicles" newspaper. It also includes a street corner post, featuring a street post with the signs for West 46th Street and Broadway, along with a "Sith Life!" newspaper vending machine and a box for "The Yoda Chronicles" newspapers. 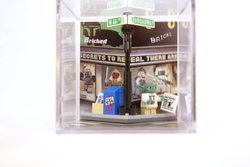 The backdrops feature Boba Fett, Stass Allie, Princess Leia and Jedi Consular minifigures, with the text "secrets to reveal there are". One hundred and fifty of these sets were made. This is the first time that the Jedi Consular minifigure was seen in any form by the public. Facts about "New York Toy 2013 Fair Star Wars Giveaway"
This page was last edited on 18 August 2017, at 00:59.